In 1974, Iranian director Mohsen Makhmalbaf, then a 17-year-old fundamentalist rebel working to overthrow the Shah’s regime, stabbed a policeman in an effort to steal his gun and served a five-year prison sentence. Twenty years later, he was casting non-actors for a film called Salaam Cinema when the victim, Mirhadi Tayebi, showed up for an open audition. 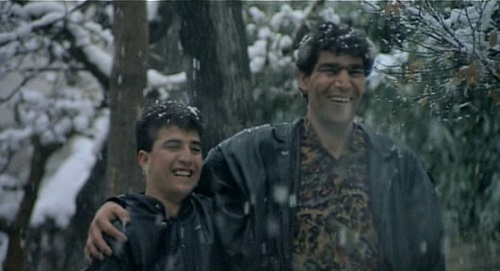 Their surprise reunion sparked the inspiration for Makhmalbaf’s startlingly original A Moment of Innocence, which revisits the incident through a meta-cinematic technique that combines documentary and fiction, and then transcends the limitations of both. Makhmalbaf and Tayebi play themselves, each assigned to cast a young man to perform their respective roles in a recreation of that fateful day. After a series of gently comic miscues, the director and the former cop finally settle on their actors and coach them to reenact the event from their particular perspective. From the opening sequence of one solitary man walking along the train tracks as the “call to the faithful” echoes from a nearby mosque the film draws its audience into an almost surreal world containing a storyline being told by two individuals from two very different perspectives. 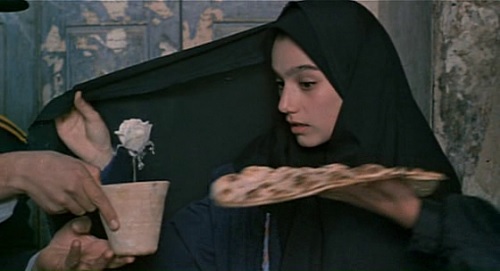 At the center of both accounts is a teenage girl (played by Marjam Mohamadamini, the woman’s daughter) who would ask Tayebi for the time and directions every day, a gesture he took as romantic while Makhmalbaf considered her an accomplice to his crime. Though its methods lie somewhere between Pirandello and Rashomon, A Moment of Innocence adds a personal dimension that's uniquely its own, as Makhmalbaf's investigation into the past evolves into a touching act of contrition. On a more universal scale, he questions the use of violence as a catalyst for positive social change. A moment of Innocence collapses fiction and documentary into an absolutely unique, humorous and overwhelmingly moving statement about violent political idealism and its collision with the realities of life and love. There is a reason many people consider Iranian movies to be the most artistically adventurous being made anywhere today, and it has to do with the intensity with which that country’s filmmakers probe the basic elements of the movie-going experience. Among the recurrent themes are the relationships of actors to non-actors and of non-actors to fictional characters, the shadowy lines between fiction and documentary, and the ability of film to convey a firsthand experience of the physical world. 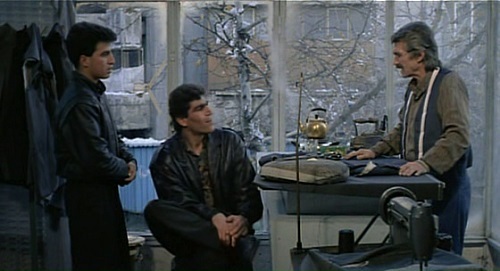 A Moment of Innocence is the film that best expresses Makhmalbaf’s understanding of truth as something that can only be understood from various perspectives (In its theme, it draws comparison with Kurosawa’s “Rashamon”, as mentioned earlier as relativity of truth told from different perspectives is the theme in Rashamon also) . In order to communicate this, he creates a new cinematic form, producing a most complex structure around the simplest external story. There must be a reason why Makhmalbaf has chosen such a form. Ultimately, he tells a story about love and reconciliation through multiple perspectives on truth, combining a lofty ideal with a novel form to achieve the integration of his cinematic vision. The basic story of the film is simply the process of filmmaking. However, through this, Makhmalbaf not only depicts character psychology and the past incident, but also his regret for his own past actions sublimates all this into a moment of love and reconciliation. With this theme, Makhmalbaf develops a multifaceted narrative structure in order to tell many stories within the one simple story. The depiction of the process of filmmaking, which is the main framework of the film, is self-reflexive and demands the adoption of the documentary mode. However, whether it is a real documentary is another question. Indeed, the process of making A Moment of Innocence itself is not a documentary one. Rather, Makhmalbaf adopts documentary as a vehicle for confession and psychological investigation. 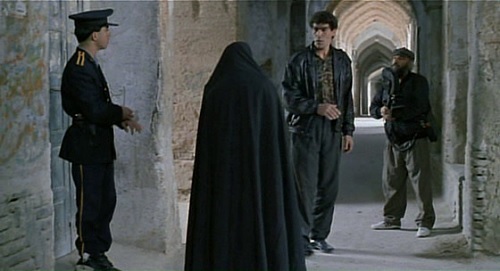 Psychological investigation is one of Makhmalbaf’s enduring concerns. In A Moment of Innocence, the psychological state of the ex-policeman playing the present-day Nasoria – the policeman Makhmalbaf assaulted – and the young men who play the young Nasoria and the young Makhmalbaf are detailed through their dialog. For example, in Sequence 2, the ex-policeman leaves the set because he is dissatisfied with the young man playing his younger self. As we see him from behind, walking down the snow-covered road in a long-shot long take, we hear Makhmalbaf and his assistant, Zinal off-screen. “I’m afraid he’ll go back home,” says Zinal. “Don’t worry,” replies Makhmalbaf. “He’ll be back.” As the ex-policeman disappears from view, Zinal runs after him. But after a while the ex-policeman returns by himself, with the idea of embellishing the incident with a love story. 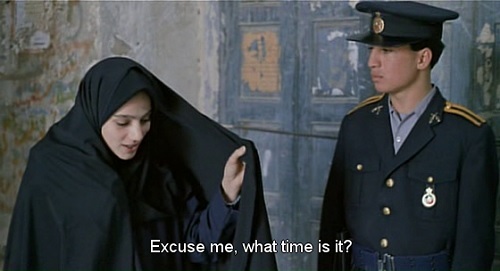 (Of course, this is not the ex-policeman’s wish, but Makhmalbaf’s. However, the documentary form of the film leads the audience to understand it as the ex-policeman’s idea.) Therefore, he wants a good-looking actor to play his younger self. Nevertheless, because he also wants to participate in the filmmaking, he compromises. 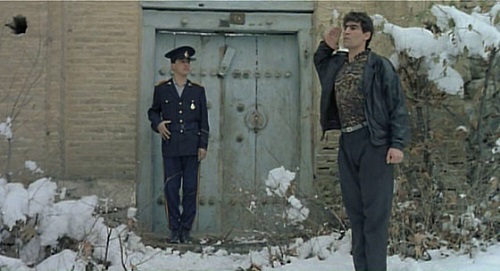 Later in the film, his dissatisfaction bursts through again and he declares that he will quit again when he realizes that the scene where he expected a beautiful rendezvous with a girl he loved has been integrated into the assault incident, Because he wants to evoke the ex-policeman’s psychological responses, Makhmalbaf resolutely omits the scene between sequences 1 and 2 where he and the ex-policeman would have discussed the direction of the film and the reenactment of the incident. This makes it seem as though the film within the film in A Moment of Innocence is an open film. In other words, it seems as though Makhmalbaf and the ex-policeman had no prior agreement about what they would film beyond the actual assault incident itself. It only seems this way, because in fact the ex-policeman’s ‘ideas’ are Makhmalbaf’s. However, even though both sets of ideas may originate with Makhmalbaf, what is significant is that this foregrounds the possibility of two different ways of directing a single subject matter. By thoroughly confusing fiction and documentary, personal history and personal fantasy, “A Moment of Innocence” becomes a heady exploration of memory, personal associations and multiple realities lures us into a Chinese-box-like world of contradictions and enigmas. As Makhmalbaf and Tayebi meticulously coach the actors playing their younger selves, you come to realize the impossibility of filming an objective, accurate account of any past experience no matter how vividly remembered it may be. When all is said and done one ultimately learns that while perspectives and accounts may alter with the passing of time actions and events remain unchanged. Time disappears in this film and one becomes lost in the intelligent dialogue and exotic urban landscape of Tehran to such a degree that when the closing credits suddenly and unexpectedly appear on the screen one feels as though awakening from a dream. And like a dream one is left with much to ponder and dissect in the days that follow. Many scenes will haunt you long after the film: not only the final freeze frame (though it indeed deserves all the praise it gets), but the interweaving of timelines and magical transitions between the past and the present. The cinematic artistry on display is much greater than many of his other films. The critic Mike D’Angelo called A Moment of Innocence a dizzying hybrid of autobiography, documentary, and mythology and a testament to our innate decency and capacity for love, and said that it “ends with the greatest final freeze-frame since The 400 Blows – maybe the greatest final freeze-frame ever”.